Since Harold was unfortunately unable to attend Terra Madre/Salone del Gusto, the international meeting of farmers and food artisans, with his Slow Food Chicago scholarship, I (miller and mill manager, Jill) was able to attend in his place. This will be the first of a number of blog posts about this incredible experience . . . but before I tell you about some of the Italian millers and farmers I’ve met and learned from, I thought I should briefly introduce the international organization called Slow Food, the huge gathering of farmers and food artisans called Terra Madre, (Mother Earth) and the 10 or more football fields of booths staffed by many thousands of food producers from all over the world who proudly present their local, authentic, pure, simple, and delicious foods. Slow Food was founded in 1986 when the first McDonalds in Italy opened at the base of the Spanish Steps in Rome. Carlo Petrini, who was a food and wine journalist at the time, was appalled. But instead of having an angry demonstration, he organized a positive protest that proved the pleasures of Italian food. To do so, he invited grandmothers from every region of Italy to prepare and share their local specialties at a long table outside the new McDonalds. His message was that instead of rushing to consume fast food, we should all pause and enjoy “slow food”—the food of our region, our families, our cultural heritage. Carlo Petrini founded Slow Food based not only on the principle of slowing down and finding pleasure and conviviality in eating and sharing food, but also on the important principle of seeking out and supporting food that is good (tasty! ), clean (no chemicals), and fair (pays the farmer and farm workers fairly for their labor. A local farmer from Tuscany demonstrates ancient stone mills. Thank goodness we at The Mill at Janie’s Farm have more modern stone-grinding technology! 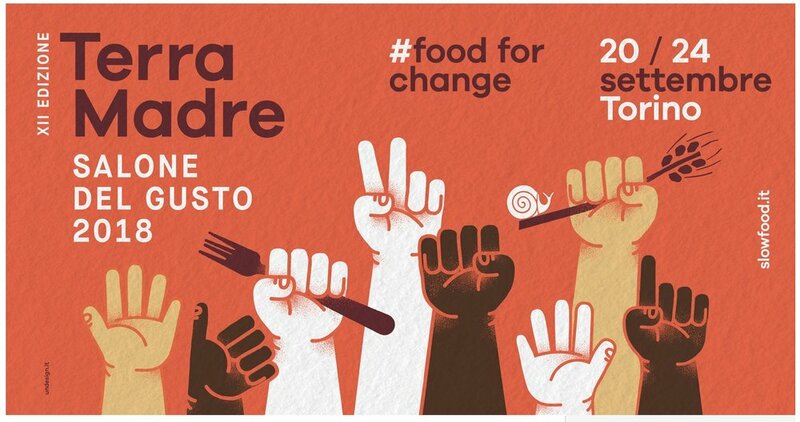 A few years after founding Slow Food, Carlo Petrini held the first Terra Madre, inviting farmers who grew “good, clean, and fair” food to attend a conference to share their knowledge and their products. Over the years Terra Madre melded with Salone del Gusto, the Hall of Taste, which features fruits, vegetables, breads, cheeses, meats, olive oils, vinegars, wines, pastries, and much, much more. But it’s so much more than just food and drink. It’s the people and their passion. They pull you in and share not only a taste of their food, but in-depth stories about what they’re growing and making and the who, where, when, how, and why of it. We already know the history of a number of mills and millers from all over Italy, the history of Sicilian marzipan, the story of a special hand-made, air-dried liver sausage — both the savory version, and the honey-preserved sweet version. The pride in the process is always apparent — from the way a plant is grown or an animal fed, to the way the millstones are hand-chiseled, just the way your grandfather taught you. It’s the same pride and passion that all of us at Janie’s Farm and the Mill at Janie’s Farm have in our process and our product, and we can’t wait to tell you more about what we’re learning here at Terra Madre and Salone del Gusto . . . a presto! La filiera corta del grano means “the short chain of wheat,“ which we at The Mill at Janie’s Farm also believe in and work towards each day — shortening the distance and making clear the links in the chain from field to mill to table.